Argyll's Lodging is a superb mansion built around an earlier core in about 1630 and further extended by the Earl of Argyll in the 1670s. 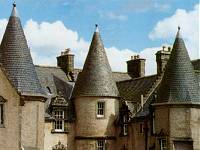 It is the finest and most complete surviving example in Scotland of a 17th-century town residence. Built by Sir William Alexander, founder of Nova Scotia, it passed to the Argyll family on his death. The principal rooms - including the laigh hall, drawing room and bedchamber, are magnificently restored and furnished as they would have appeared during the 9th Earl of Argyll's occupation around 1680. The furniture and furnishings include beautifully carved and inlaid tables, elegantly uphosltered chairs and glorious tapestries and hangings.Based on detailed inventories, the interiors have been authentically recreated to the highest standards by skilled craftsmen. At the top of Castle Wynd, off the M9.